Light Wave Bands - L.E.D. Glow Bracelets - By Fun One Inc. The Night Light Wave Bands are a L.E.D. 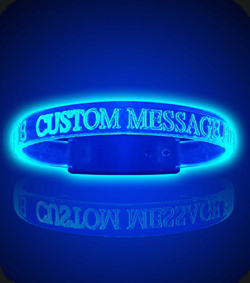 glow bracelet that you can select your custom glow colors and custom engrave with your choice of text on each band. Customizable L.E.D Glow Band Bracelets. Minimum 100 per order. Makes a great fundraising idea or a fun glow item for your night event or party. Makes a great wedding reception guest gift idea. Custom light up band gift for your wedding guests. Or call us to order light wave bands custom glow bracelets today! The Night Light Wave Bands are a L.E.D. glow bracelet that you can select your custom glow colors and custom engrave with your choice of text on each band. Customizable L.E.D Glow Band Bracelets. Minimum 100 per order. Makes a great fundraising idea or a fun glow item for your night event or party. Custom light up band gift for your wedding guests and ideas for wedding receptions guest, graduation parties gift ideas. Choose from any of the following colors for your customizable light wave glow bands. 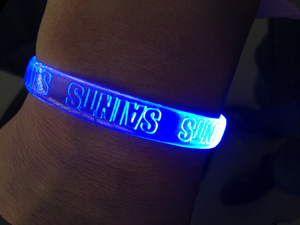 Each light wave glow band comes with custom color plastic battery unit, custom color L.E.D. light band and your message custom engraved on each band. You pay $2.50 per band and sell them for up to $5.00 each. The Glow Night Wave Bands are a fun and unique fundraising idea for your upcoming event. L.E.D. 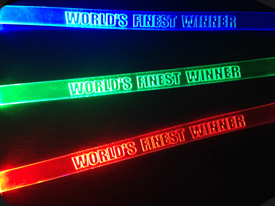 glow light bracelets make a great sales / fundraising idea for your school dance, school store, night clubs, dance party, high school prom or other class fund raiser.